Turnovers plagued the women’s basketball team as they fell to the Cougars of Saint Francis on Saturday afternoon by a score of 50-74. 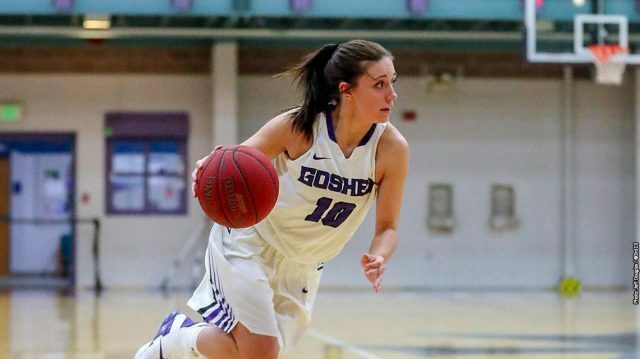 First-year Graysen Cockerham started her career-high afternoon by draining a three just 25 seconds into the game off an assist from senior guard, Haley Archibeque. After that, free throws gave Saint Francis the early edge as they knocked down six of seven in the first quarter to take a 16-12 lead heading into the second quarter. The second quarter was one to forget for the Maple Leaf offense. Eight turnovers and 25% shooting from the field opened the gate for the Cougars. Despite the poor execution on offense, Goshen held their own on the defensive end, holding USF to just 28% shooting from the field, including 1-10 from three. However, second chance opportunities led the Cougars to find their stride. Seven offensive rebounds in the second quarter led to nine points and aided the shooting struggles for the Cougars. A late three point jumper by Archibeque drew the Leafs closer, but heading into halftime, Saint Francis nursed a 31-19 lead. The first-year duo of Cockerham and TaNiece Chapman kept the Maple Leafs in it as they combined for 12 third quarter points. Halftime adjustments solved the rebounding struggles for the Maple Leafs as they held Saint Francis to no offensive rebounds, but the Cougars caught fire in the third quarter and outscored Goshen, 23-18 behind 58% shooting and four threes. Entering the fourth quarter, Goshen needed a run early in order to keep their victory hopes alive. However, a 9-0 run to start the quarter from the Cougars would inflate their lead to an insurmountable 27 points. Efficient scoring from Saint Francis led them to a comfortable 74-50 victory over the Maple Leafs. Cockerham led all scorers with a career-high 21 points. Freshman centers Chapman and Keyaira Murff each added six points and combined for 13 rebounds. Senior Alyson Prigge grabbed six boards and a blocked shot. With this loss, the Maple Leafs drop to 7-13 overall and 0-8 in conference play as USF moves to 5-3 in the conference. Goshen will play host to the Cougars of Spring Arbor in their next game on Saturday, Jan. 19 at 1 p.m.